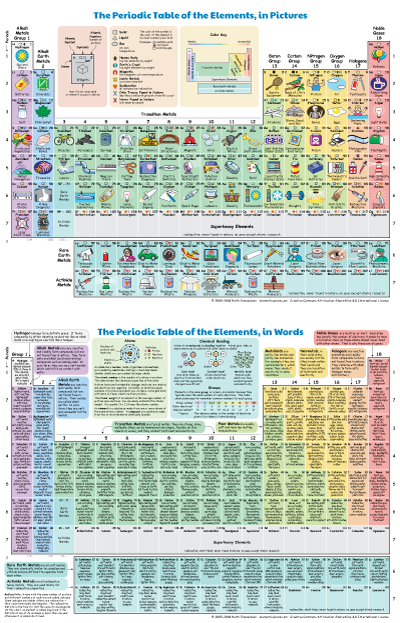 These colorful, fun, and informative periodic tables are great for elementary, middle, and high school students, as well as adults. Print at letter size (11x8.5 in) or poster size. 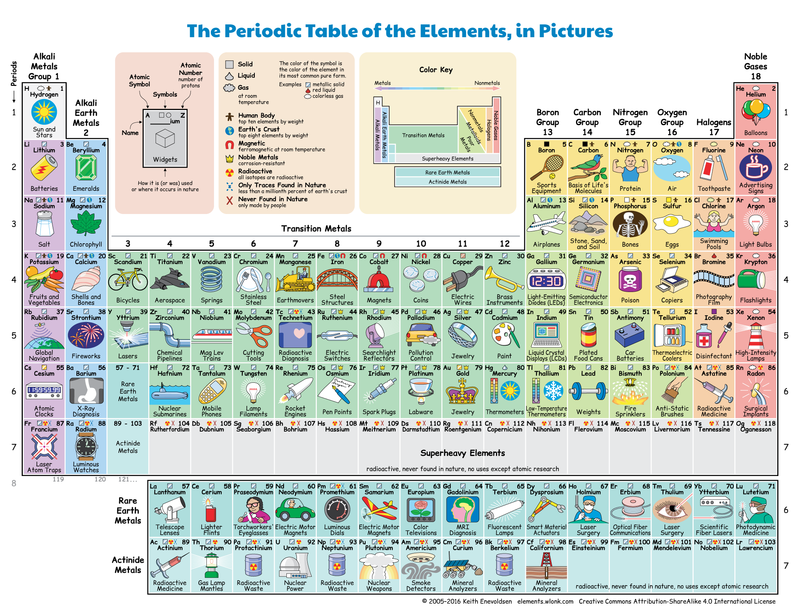 This pictorial periodic table is colorful, fun, and packed with information. In addition to the element's name, symbol, and atomic number, each element box has a drawing of one of the element's main human uses or natural occurrences. The table is color-coded to show the chemical groupings. Small symbols pack in additional information: solid/liquid/gas, color of element, common in the human body, common in the earth's crust, magnetic metals, noble metals, radioactive, and rare or never found in nature. It does not overload kids with a lot of detailed numbers, like atomic weights and valence numbers. Note: Elements in Pictures and Elements in Words are a set. Either may stand alone, but they work best together. 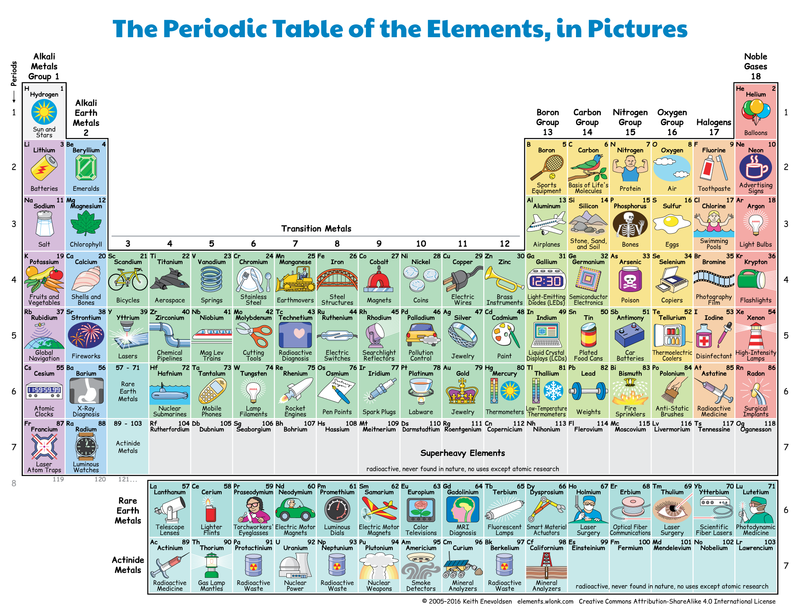 See also: Interactive Periodic Table of the Elements, in Pictures and Words. This contains most of the same information on an interactive web page. See also: Links to translations in other languages. 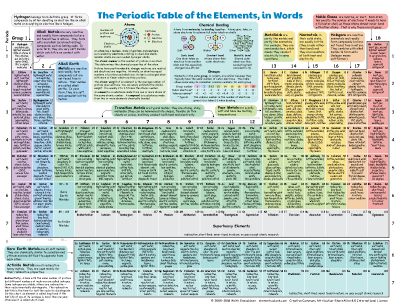 This textual periodic table is packed with even more information. 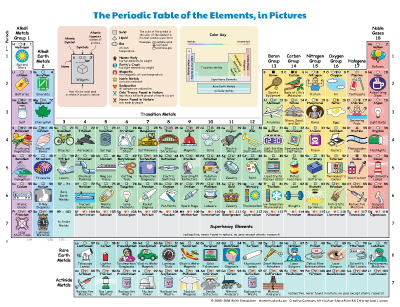 In addition to the element's name, symbol, and atomic number, each element box contains a textual description of the element's physical properties and a list of several of its human uses and/or natural occurrences. 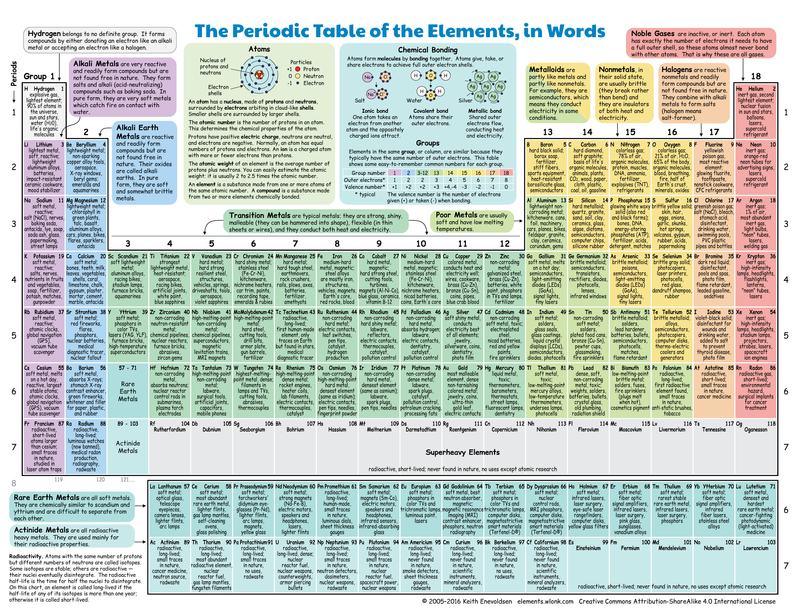 The table is color-coded to show the chemical groups, and each group is described in a panel of the same color. Other info panels describe atomic structure, chemical bonding, and radioactivity. It does not overload kids with a lot of detailed numbers, but it does provide some simple rules-of-thumb about atomic weights and valence numbers. 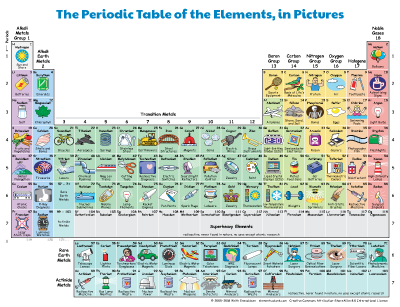 See also: The Elements — Descriptions, Uses and Occurrences. 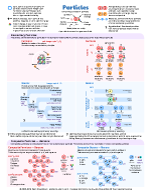 This contains most of the same information, but in a less graphical, more textual html format. It also contains handy links to search for more info about each use. Print at ledger size (11x17 in) or poster size. This has both Elements in Pictures and Elements in Words combined on a single page. This is exactly the same as Elements in Pictures above, but with less information. The fine print — the legend boxes and the small symbols — have been removed. Use this if you want a cleaner image with less visual clutter, or you want less information, or you want to print smaller or at lower resolution. Print at letter size (8.5x11 in) double-sided on card stock. 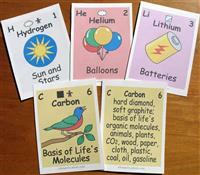 Print-your-own elements cards. Print double-sided on card stock. Cut out cards with paper cutter or scissors. Nine cards per sheet. There's a card for every element, with a picture on the front and words on the back. Also included are key cards (symbol key and color key), info cards (atom info and bonding info), and group info cards. The zip file also includes a template for making a card box. It also includes printing instructions. Sorry, card decks are not for sale at the Wlonk Shop. You need to print them yourself. Print at letter size (8.5x11 in) single-sided. Print each element on a separate sheet. Print single-sided. Elements 1-98 have pictures. Also included are key sheets (symbol key and color key), info sheets (atom info and bonding info), and group info sheets. Sorry, elements sheets are not for sale at the Wlonk Shop. You need to print them yourself. This color-coded chart shows what atoms look like. This chart shows all the fundamental atomic electron orbitals as electron probability density distributions (fuzzy clouds), which is close as you can get to visualizing what an atom really looks like. 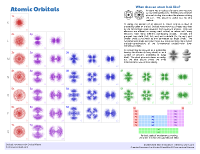 The orbitals are labeled. It describes other ways to visualize atoms, namely, electron orbits (like planets) and surfaces of constant probability (bulgy blobs). It has a small periodic table showing in which order the electron shells are filled. This white-on-black chart shows what atoms look like. 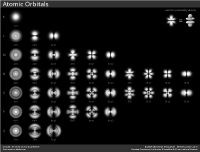 This chart shows all the fundamental atomic electron orbitals as electron probability density distributions (fuzzy clouds), which is as close as you can get to visualizing what an atom really looks like. The orbitals are labeled. This elegant chart has little visual clutter. Note: To print this black chart you'll need a good printer and you may need to adjust your print settings. Print at letter size (8.5x11 in) or poster size. This chart shows what the universe is made of. This chart shows all the elementary particles in the standard model (SM) of particle physics, and many non-elementary particles too. It starts with the basics: an atom contains a nucleus of protons and neutrons, which are made of quarks. 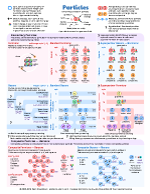 The chart organizes all the important particles and classes of particles: elementary fermions (quarks, leptons, electrons, neutrinos), elementary bosons (gluons, photons, W and Z bosons, Higgs, and predicted gravitons), composite particles (hadrons, baryons, protons, neutrons, mesons), anti-particles. This chart does not show the many predicted supersymmetry particles. See also: Plain list of particles, standard and hypothetical. This chart shows what the universe is made of. This chart shows all the elementary particles in the standard model (SM) of particle physics, plus the many predicted supersymmetry (SUSY) particles. Many physicists think supersymmetry is likely to exist, and many physicists do not. Note: In the coming years, physicists may discover new particles or significantly revise the standard model of particle physics, due to new experimental results from colliders, such as the Large Hadron Collider (LHC), and new observations from telescopes. Reference: IUPAC is the world authority on the naming of elements (see IUPAC periodic table).